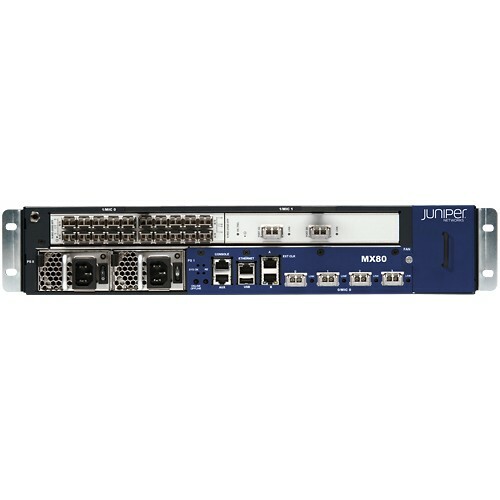 Used Juniper MX80 routers combine features of higher-powered MX Series routers with entry-level routers. This combination allows the MX80 to offer flexibility and scalability without sacrificing a small and space-efficient body. The MX80 router is the highest-performing router measuring 2 rack units (RU) in the MX Series. Like several other routers in the MX Series, the MX80 is designed as a fixed-configuration router, but it supports more ports and port configurations than other routers in the series that are the same size. It has three Modular Interface Card (MIC) slots, in addition to four 10G Ethernet slots. Although the MIC slot on the back of the router is made only for a Multiservices MIC (MS-MIC), the two MIC slots on the front are fully customizable. The flexibility allowed by the two front MIC slots – combined with the four 10G Ethernet slots – make the MX80 router the most scalable router that measures only 2 RU in the MX Series. The MX80 supports up to 10G Ethernet and has a maximum capacity of 160 Gbps. By reviewing the chart below, you can see the MX80 has several 10G Ethernet ports, unlike other routers that are 2 RU in size. It also shares similar specifications with some of the MX Series’ most powerful fixed-configuration routers, such as the MX104. If you’re interested in reviewing more specifications for the MX80 or other fixed-configuration MX Series routers, please reach out to our support team. We can send you PDF datasheets to compare the pre-owned MX80 routers we buy and sell to our other in-stock MX Series routers. BrightStar Systems offers the best deals for pre-owned MX80 routers, whether we’re buying from enterprises, service providers or individuals. We also make selling your used Juniper MX80 routers a hassle-free process. We cover all shipping costs, regardless where in the world you’re based, and we can set up freight pickup if you’re interested in selling your pre-owned MX80 routers in bulk. We sell all our used MX80 routers as an independent Juniper dealer, which ensures you receive maximum value for the hardware you sale. And the fact that all our equipment is thoroughly tested for quality means it’s on par with Original Equipment Manufacturer (OEM) standards. Contact one of our sales representatives to find out how you can turn your used surplus MX80 routers into a financial asset for your operation. You won’t find more affordably priced used Juniper MX80 routers. Whether you’re looking to replace specific router parts, upgrade a few existing routers, or replace your entire lineup of routers, we can get you the equipment you need at a cost-effective price. We’ve been in business for more than 20 years, and have developed relationships all over the world with the biggest names in the industry, including Fortune 500 companies. Those relationships are a testament to the quality of pre-owned Juniper MX80 routers we sell, and emphasizes our dedication to offering top-notch service. 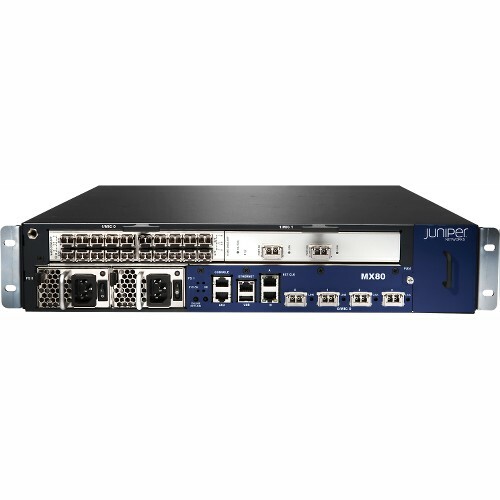 For more information on our in-stock used surplus MX80 routers, or if you are interested in receiving a quote for your Juniper hardware, please contact our sales team. Our pricing process ensures you receive the best prices available for both buying and selling used MX80 routers. We don’t apply standard rates to every order because every order is different. Instead, we collect detailed information on the hardware you’re looking to buy or sell, and provide you with a tailor-made quote or offer. Despite the fact it’s easier than ever to sell goods online, we’re an independent stocking dealer of used Juniper hardware, which means we can pay more for your equipment. We also can pay for your pre-owned MX80 routers up front, saving you the trouble of collecting payments. Working with BrightStar Systems means you’ll have access to a team of networking experts who have years of industry experience, and who can walk you through the entire sales process. Our staff will be able to answer any questions you have and provide all the information you need to make an informed buying or selling decision. On top of that, any equipment you purchase is covered for an entire year under BrightStar Systems’ 1-Year In-House Warranty. Contact us today if you’re interested in buying or selling pre-owned Juniper MX80 routers, or any other used surplus MX Series hardware. Our sales representatives will help you get the process started right away. 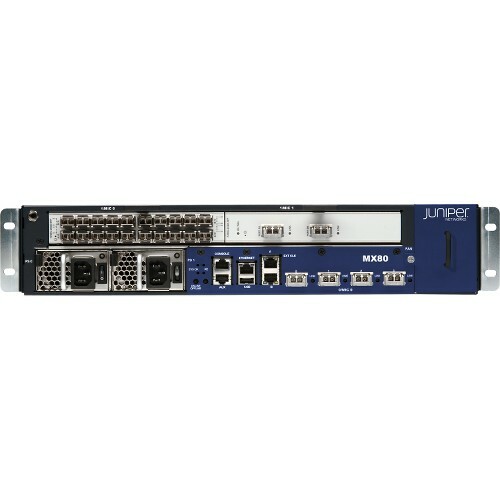 Read more about Juniper MX80 specs with the suggested downloadable pdf datasheet. Contact us about used surplus MX80 routers with our BrightStar Systems’ 1-Year In-House Warranty.